How to calm down hyper dog? The term hyperactivity is commonly used to describe over excited and excessively active dogs. However strictly speaking, hyperactivity is a medical condition that is quite rare in dogs. Truly hyperactive dog is likely to show abnormal frantic behaviour. For a clinical diagnosis of dog hyperactivity various symptoms have to be present, like increased resting heart and respiratory rates, failure to adjust to common stimuli like everyday household noises and activities, agitation, reactivity, sustained emotional arousal and an inability to settle down and paradoxical calming response to amphetamines. Most hyper dogs on the other hand suffer from boredom and lack of stimulation. They have excess physical and mental energy that needs to be directed somewhere. Puppies have lot of energy and get excited easily. This is why puppy training and socialization is so important. It helps your puppy to drain his excess energy in a constructive manner. Puppies that do not get adequate outlet for their enthusiasm can easily become hyper and difficult to control. All dogs need daily exercise and playtime. However, some dog breeds are more active than others are. Typical active dog breeds include Collies, Spaniels, and German Shepherds. Active dog breeds require more intense exercise, i.e. to avoid them becoming bored and hyper. Physical exercise is though not enough, they also require mental stimulation. These dogs love to work and to be involved in high energetic activities, like dog agility or flyball. Some dog breeds are more reactive than others are. These dogs tend to react energetically to everything in their environment. They may go berserk when the doorbell rings or when a car stops outside the house. This excessive reaction can be annoying to deal with. Dogs tend to behave in a way that is rewarding for them, i.e. results in food, game, walk… or our attention. If we pay attention to our dogs when they are misbehaving, they learn that misbehaving will get our attention. We have accidently reinforced unwanted behaviour. Dogs that crave attentions this way can easily become hyper dogs. These tips help with hyperactive dogs but we use the both terms (hyper and hyperactive) for overactive dogs that suffer from excess energy and lack of stimulation. It is important not to reward the dog when he shows hyper behaviour. The best way to stop unwanted behaviour is to ignore it. Don't say anything, don't touch your dog, don't even look at him. This may make your dog even more hyper at first but he will soon enough realize that this is not getting him what he wants, i.e. your attention. However, when your dog behaves as you want reward him with plenty of attention from you. This will encourage the dog to behave the way you want him to. Our dogs are extremely good at mirroring our behaviour. If you hyper, your dog is likely to be hyper too. Therefore, when your dog is hyper, it is important that you stay calm and collected. This should calm your dog down much quicker than if you react in any other way, e.g. by becoming angry or frustrated. All dogs need daily exercise and active dog breeds needs lot of it. Physical exercise is not enough, all dogs need mental stimulation as well. Increasing the time spent on exercising and playing tends to be the best way to calm down hyper dog. No matter what breed or how small your dog is, your dog does not get enough exercise by running around on his own in your garden or by walking around the block on a lead. Your dog needs to be able to run around off the lead on daily basis too. Long walks are great exercise for dogs. However, to drain the excess energy you may want to up the game. Dogs love running, so why not go out jogging with your dog. If you don't like jogging, how about cycling with your dog or take him roller-skating. Swimming is another excellent way to expel extra energy. If your hyper dog loves swimming, take him swimming as often as possible. Energetic games are good exercise too. They also tire your dog mentally. Games like fetching ball and catching Frisbee, requires your dog to be… on the ball. Hide and seek is also excellent for mental stimulation. As is dog agility and flyball. Dogs were originally bred with specific working purpose in mind, like guarding, herding, retrieving, and hunting. It is ideal if you can match your dog’s exercise and games with his breed characteristics. Labradors for example love swimming and retrieving, Beagles love sniffing which beneficial for hide and seek and tracking games, Collies tend to love balls and are good in dog agility, etc. Obedience training should also be part of your hyper dog treatment plan. Your dog must learn to stop and listen to you. The "stay" command is one of the most important command you can teach him. If you need help with hyperactive dog then you can buy good obedience training book or attend obedience class. The second option has additional benefits as you will not only be getting professional help with your dog, he will also benefit from socializing with other dogs. Training classes are also mentally exhausting for the dog (and the owner). In recent years, there have been big discussions about potential link between hyperactivity in children and their diet. Many believe the same to be true for dogs. Therefore, if your dog is hyperactive, you may want to reconsider his diet, including the treats you give him. 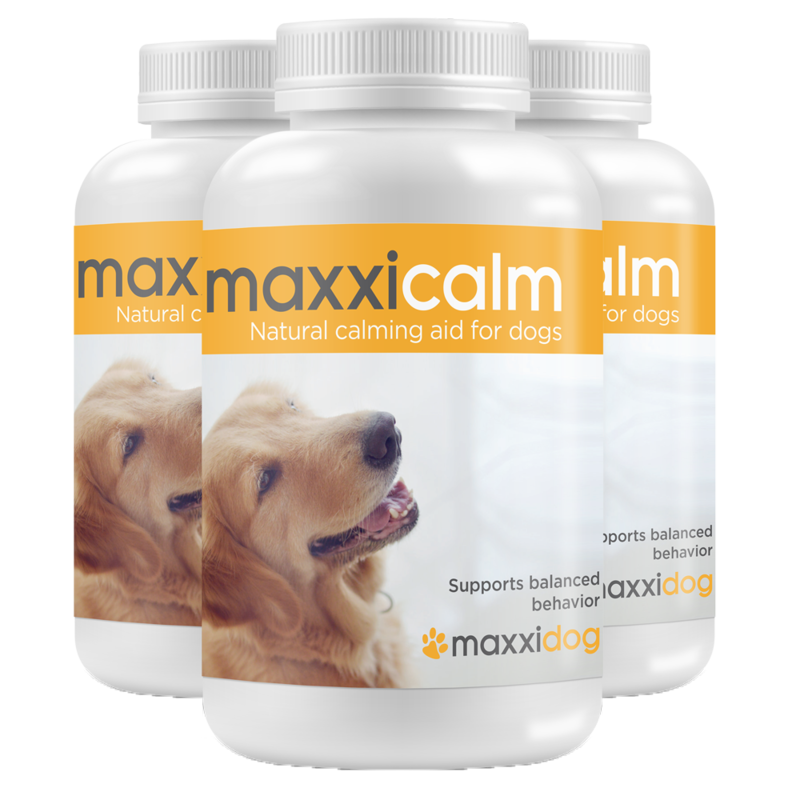 Good quality calming aid for dogs, like maxxicalm, can also benefit hyperactive dogs, especially while you are getting the situation under control. Calming aid can escalate the training progress and reduce your dog's hyperactive behaviour. It is though important to follow the above tips as well, especially about increasing your dogs' physical and mental stimulation.